Senior MDC-T members have started jostling for the seven parliamentary uncontested seats that were created following its recall of 21 legislators. These had left the party to form the MDC Renewal. MDC-T resolved not to participate in by-elections for the contested parliamentary seats, but indicated that it will field names for those proportional representation seats that were uncontested. This has been viewed as hypocritical as the opposition party claimed that it will not participate in by-elections, but was comfortable to field candidates under the proportional representation. The opposition has three seats apiece in Harare metropolitan province and Bulawayo province while it has one Senate seat in Manicaland Province. While the party has settled for former legislator Mr David Chimhini for Manicaland, it is in the two metropolitan provinces that party members were jostling. Sources said some members of the standing committee would want to be seconded to Parliament and/or have their proxies, so that they could consolidate their influence in the faction-ridden opposition outfit. 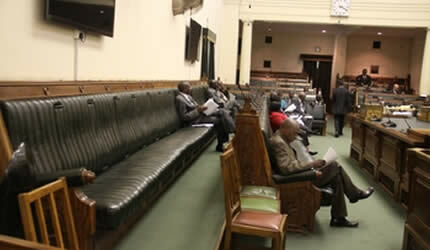 More than half of the party’s standing committee members are not in Parliament including MDC-T leader, Mr Morgan Tsvangirai, national chairman Mr Lovemore Moyo, secretary-general Mr Douglas Mwonzora, treasurer-general Mrs Theresa Makone, her deputy Mr Charlton Hwende and party spokesperson Mr Obert Gutu. Sources in the party said they had settled for Mrs Makone and Ms Anna Chimanikire to take up seats in the Senate to replace Ms Roorana Muchiwa and Mrs Sekai Holland in Harare metropolitan province. It is understood that Ms Yvonne Musarurwa was set to replace Ms Evelyn Masaiti as MP, while Mr Chimhini was likely to replace Senator Patrick Chitaka in Manicaland. The decision had riled other party members who felt that they deserved to be seconded. Bulawayo metropolitan province, which has of late been rocked by intra-party disturbances was still debating, said sources in the party. When contacted for comment, Mr Gutu denied that there was jostling for posts. “The MDC is a disciplined party of excellence. We have since identified members to be deployed to both houses of Parliament under the proportional representation system. In the fullness of time, we shall be disclosing the names to the public. “There is no jostling for the seats. We are, as a party, focused on finding lasting and sustainable solutions to the deteriorating political and economic situation in the country,” said Mr Gutu.